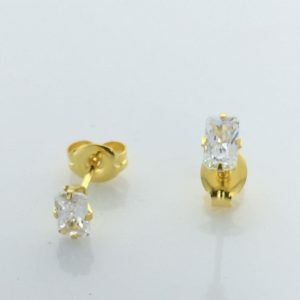 When is comes to earrings for sensitive ears in birthstones, take a peek at these Studex Gold Plated 5MM November Topaz Earrings (Sensitive). This is the “Fashion” style and is not “for piercing”. These earrings have a blunt, notched post for comfortable wear all day long. The base metal is stainless steel for your hypoallergenic protection against irritation. The hypoallergenic metal finding and post are made from a base of high grade surgical stainless steel and plated in pure gold. These birthstone earrings are bursting with color, perfect for children of any age. Each pair comes with a set of earring backs made with the same surgical stainless steel material plated in gold. The grooved post provides a secure fit so you can wear them in any situation without the risk of them getting lost. Very durable and safe to wear in the shower or to bed. Since 1976, Studex has been an industry leader in manufacturing fashion earrings for sensitive ears. They have uncompromising commitment to quality. They exceed US FDA regulations and EC standards. They strive to provide customers with the highest quality products, and they are now at your fingertips with Sensitively Yours. In addition to their commitment to quality, they are also entirely made in the USA. They manufacture all their products and components in their own American-based facilities. Close attention is given to quality control and a superb finished product. Backed by a lifetime guarantee against reaction, Sensitively Yours is pleased and proud to carry their line of Sensitive Earrings.